Buddy studied guitar and bass with Leonard Savino, and bass with Jerry Carboy and Alex Blake. He has an Associate Degree in music from Ocean County College, and has taught at Monmouth Music since 1980. Buddy has presented bass and drum clinics with Bernard Purdie. He played with the Jazz Lobsters big band from 1992 to 2011, and currently plays Jazz and American Songbook at the Raven and Pearl. He has also worked with such artists as Bernard Purdie, Danny Walsh, Bob Ferry, Chuck Welch, Jimmy Desalvo, and Charly Clarke, and is the house bass player at City Lights Recording Studio. 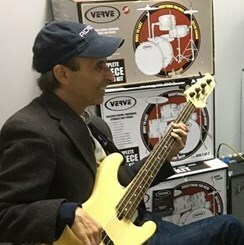 Request Lessons with Angelo Savino today!